Kaya Maghan, the despotic king of Wagadou, follows the instructions of his priest by ordering the religious sacrifice to the Python God of Sia Yatabene, the virgin daughter of a notable family. A gift of gold equivalent to Sia’s weight is given to her family as compensation for surrendering their daughter for the sacrifice. However, Sia runs away and finds shelter in the home of a mad prophet who has railed against the king. The king orders his top general to locate Sia, but the general is conflicted since Sia was engaged to marry his nephew, Mamadi, who is in battle on behalf of the kingdom. Mamadi returns and joins his uncle to do battle against the Python God. 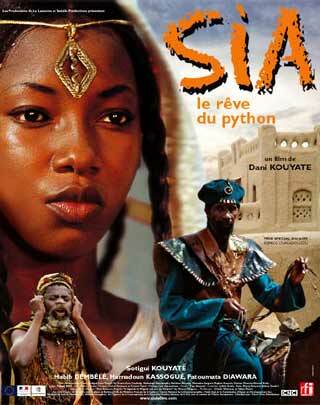 The inspiration of Sia, le rêve du python is a seventh-century myth of the Wagadu people of Western Africa, which was adapted into the play La légende du Wagudu vue par Sia Yatabéré by Mauritanian writer Moussa Diagana. He also adapted the screenplay with filmmaker Dani Kouyaté.